Last summer, we traveled in Japan for a whole month, so we decided to book a Japan Rail Pass only for the last two weeks. 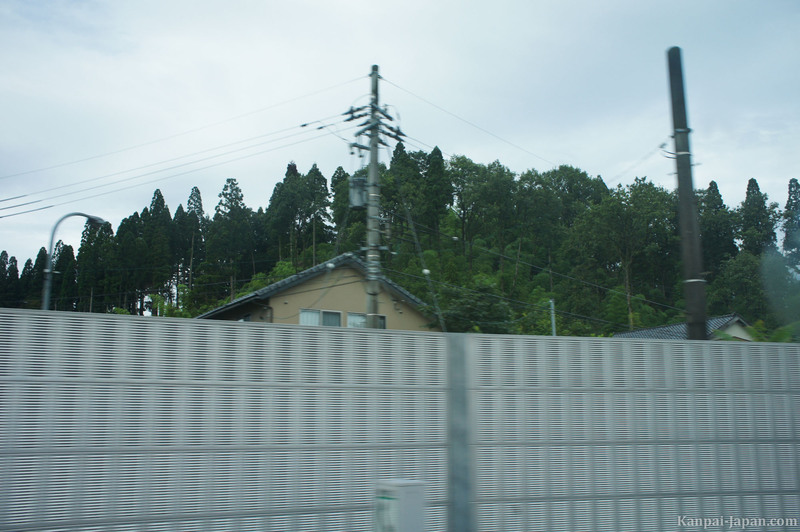 The journey between Tokyo and Kyoto had to be otherwise than by train, for budget issues. In Japan, the bus network is extensive, as for the rest of transportation systems. We chose to test an overnight bus, and we saved one night of accommodation at the same time. There are many night bus companies but a lot of them don't offer online booking. 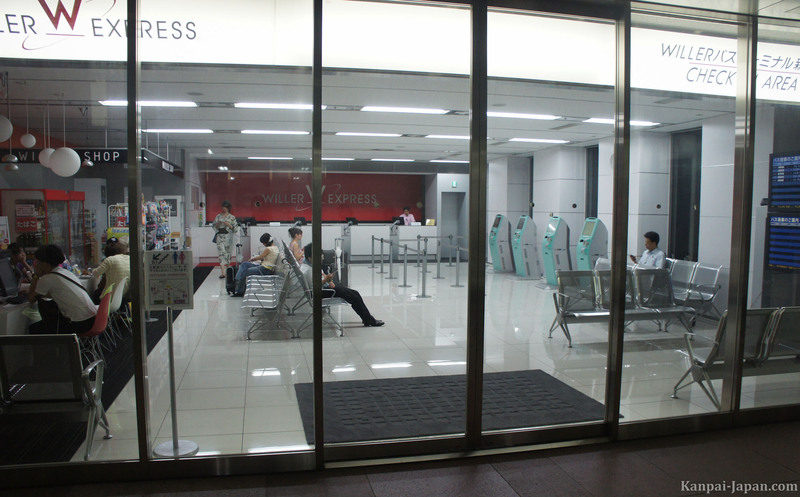 Willer Express, the company we took, has three major advantages for foreigners : it's quite cheap, it has an English website and it offers payment in advance on the Internet. 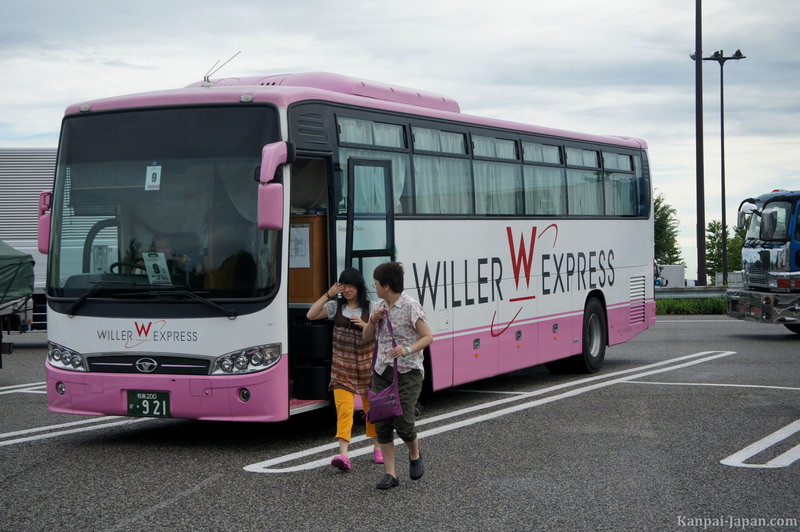 On WillerExpress website, you must first enter cities of departure and arrival, and the intended date of travel. Then a list of available routes is displayed according to the timetable and bus types. Indeed, there are several classes of transportation, much like the airplane or train. This mainly changes the type of seats (tilt, space available, legwear, feet or head accessories...) but also the presence of toilets or even Wi-fi on the bus. 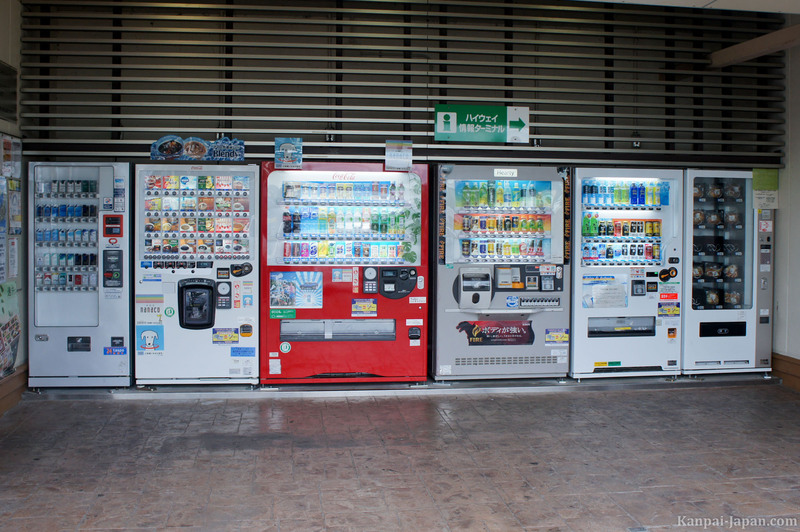 As for Tokyo - Kyoto, prices generally go from 3,800Yen to ¥9,000 and above. We chose a wholesale service for ¥5,000 (about US$60 at that time) with 140° reclining seats, footrests, and cover cap for the head. Payment is made by credit card on the site and you receive a confirmation e-mail with a reservation number. Between one hour and fifteen minutes before departure, you must go to their office to collect the tickets. In Tokyo, Willer Express offices and cars departure are at the Sumitomo building in Shinjuku West. The staff welcomes you and helps you using terminals to get your ticket(s), with the reservation number and your phone number registered on the site (no problem if it's not a Japanese phone). 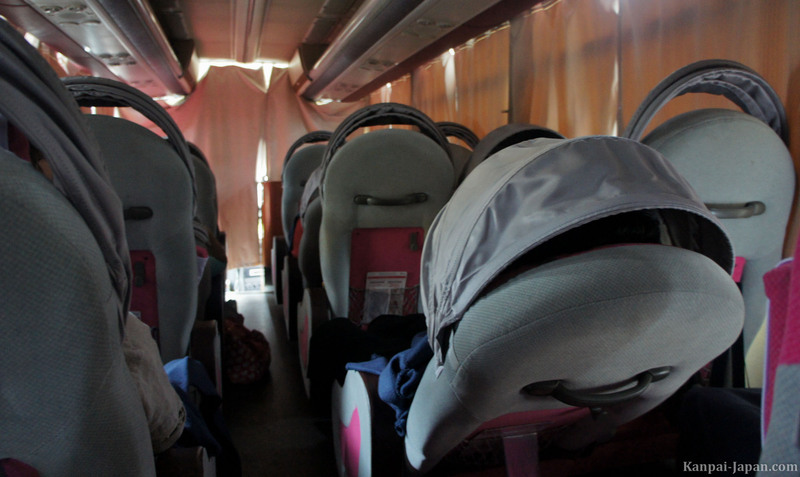 Of course, inside the bus, everything is very clean. 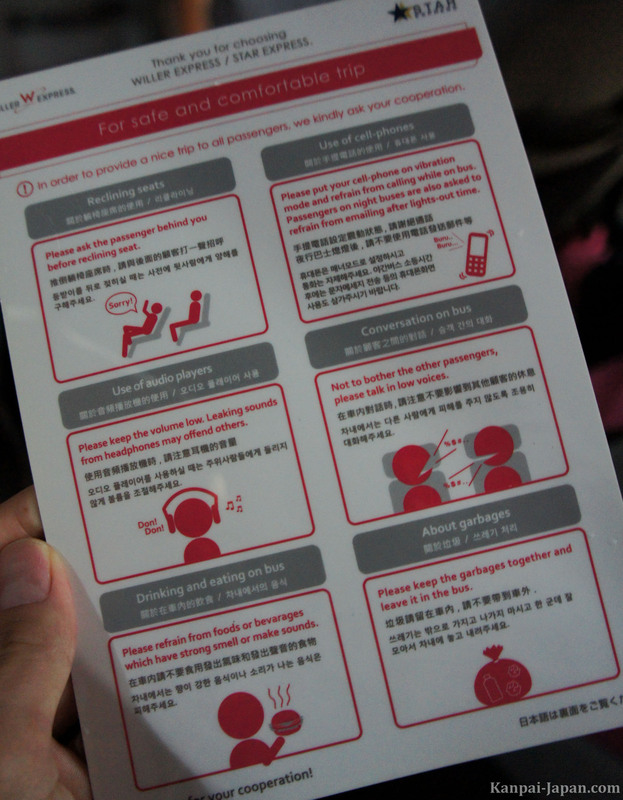 The population is calm and respects the instructions, such as: no screens on when the bus is in 'night' mode. Probably because of electricity restrictions in force since March 11, the air conditioning worked intermittently, I would say by 10 minutes laps. Overall, the experience was quite comfortable. It saves you a hotel night and the trip is a lot cheaper than Shinkansen train.